Knitting a large blanket can be like climbing a mountain with some preparation and a lot of hard work. But it is a tremendous sense of pride, accomplishment, and beauty at the very end. Have you ever tried making an illusion knitting pattern? 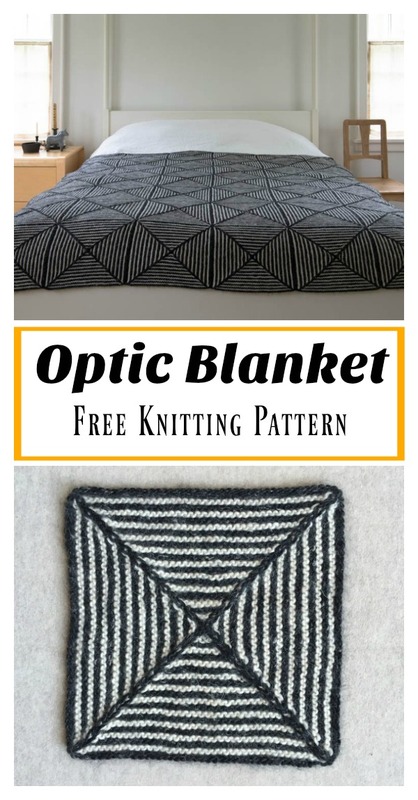 This amazing Optic Blanket Free Knitting Pattern creates the same effects as cool optical illusion pictures. You work each square in the round from the periphery inward, decreasing with simple central double decreases. It is suitable for almost all levels of knit experience from beginner to advanced levels. Thanks Purl SOHO sharing this free pattern. The link for the free pattern is provided below photo. Happy knitting. You might also like Heavenly Baby Blanket Free Knitting Pattern.